This entry was posted on June 5, 2012 by Russell Smith. 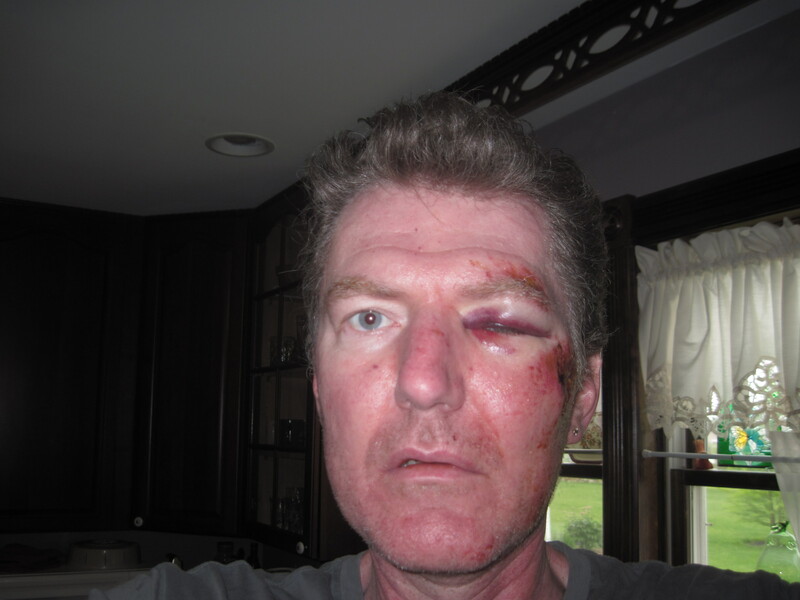 It was filed under Vacations and was tagged with bruises, cheek, eye, injury, Russell Smith. oh my…. I’m so so sorry for you. what did you do, man? reckless man, 🙂 i hug you! I hug you right back! That looks nasty. I hope you are ok! Thanks for your concern, Sara. I am feeling much better. 90% healed. Nothing broken. Marginal scarring on my left cheek. I lucked out. Didn’t bite my tongue, break collar bone, nothing. I was walking without my cane. A big no-no. It looks so much better. There will be minimal scarring. You’re the sweetest mom in the whole world. So lucky to be your son. I still feel terrible about your fall. It was horrible. You were so brave… I’m so glad that you’ve healed so well. The scars just make you look “ruggedly” hansom now. I love you!